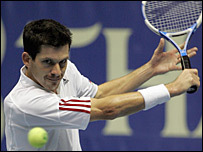 Tim Henman beat British opposition for the second match in a row, seeing off Alex Bogdanovic 6-3 5-7 6-1 in the second round of the Thailand Open. Henman, who beat British number one Andy Murray in the first round, looked on course for a comfortable win in Bangkok after taking the first set 6-3. But left-hander Bogdanovic, 10 years younger than his opponent at 22, fought back strongly to take the second set. His resistance finally crumbled in the third, allowing Henman to advance. In the quarter-finals, the British number two will play Thai eighth seed Paradorn Srichaphan, who beat Russian wildcard Mikhail Ledovskikh 6-4 5-7 6-2. Henman enjoyed a straightforward 6-4 6-2 win over Murray on Wednesday and began well again, taking the first set in 35 minutes. But any hopes Henman had of a routine win were quickly dispelled by Bogdanovic in the second set. The Belgrade-born Briton threatened Henman's opening serve in the second set and finally broke to establish a 4-2 lead. Henman broke back two games later only to concede his serve again at 5-5. Bogdanovic had to save three break points in the next game but finally held, with the help of two close line calls, to force a deciding set. Both men faced break points in their opening service games in the third set before Bogdanovic, who is ranked 148 in the world, finally cracked. He made a couple of unforced errors when serving at 1-2 and Henman took full advantage to break. Bogdanovic's resistance began to crumble as a relieved Henman raced through the final set to reach the last eight. "Alex made life very difficult, I had to work hard," said Henman. "At the 6-5 game in the second set, it was frustrating to say the least to get calls like that. Instead of winning, we were into a third set. "But I felt good physically. I remained patient and played a good third set." In other second-round matches, US third seed James Blake cruised past Benjamin Balleret of Monaco, winning 6-3 6-2. Unseeded former world number one Marat Safin was made to work for his win over Julien Benneteau of Frandce, going through 7-6( 7-5) 6-7(3-7) 6-2. Top seed Ivan Ljubicic of Croatia ground out a 7-6 (8-6) 7-5 victory against Germany's Benjamin Becker.